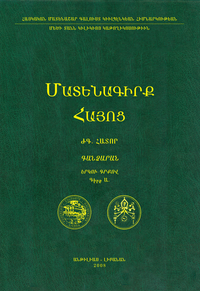 The “Matenagirk Hayots” (or Armenian Classical Authors), significant multiple-volume handbook of Armenology and bibliography, has been published since 2003. 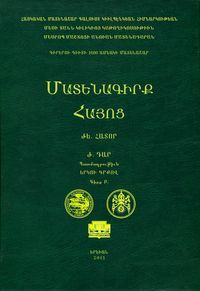 Zaven Yekavian (long-time head of the Armenian department of “Calouste Gulbenkian” Foundation) together with the Catholicosate of the Great House of Cilicia, for the first time in Armenian literary history, published original manuscripts of Armenian bibliography of 5th to 18th centuries. Sixteen volumes have already been published with more than hundred authors and several hundred original texts, most of which (roughly 80%) are being published for the first time. 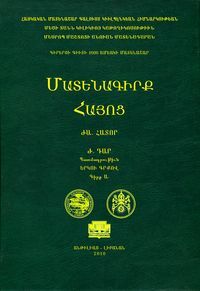 This edition is an indispensable and unique source for various branches of Armenian studies: philosophy, history science, linguistics, ancient literature, and folklore. Along with the Matenagirk Hayots some volumes have been digitized and are available online. It makes easy for Armenian and foreign specialists to use the digitized versions for their researches. 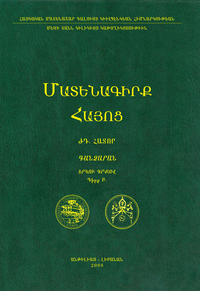 According to specialists predictions in case of publishing of all Armenian bibliography we can have roughly hundred enormous volumes of the Armenian Classical Authors’ series. From these important and extensive series are Patrologia Graeca, Patrologia Latina, and LOEB.